Many businesses requiring wireless printing solutions in markets such as Retail, Hospitality, Payment, Logistics and Warehousing are expanding and strengthening their wireless solutions using new mobile infrastructure technology. Wi-Fi connectivity was always a key factor in this trend but has historically been complex when linking up non-LCD embedded industrial printers to Wi-Fi networks. For instance, Ad-Hoc and Wi-Fi direct one-to-one network systems are popular methods for setting up Wi-Fi printers. However, the user experience to configure these networks has always been a challenge, requiring an understanding of various technical concepts such as node, encryptions, security, etc. BIXOLON is aware of these issues and has provided a solution which removes the complexity of Wi-Fi networking its printers. Since 2017 BIXOLON has adopted a new mode called SoftAP onto a selection of its printers to enable easy Wi-Fi setup. Its printers enabled with SoftAP act as an access point (virtual router). Users can then directly connect their mobile devices or computers with a BIXOLON printer (without using a Wi-Fi router) using the SoftAP function. Easy Wi-Fi setup with SoftAP printers The SoftAP mode establishes a wireless network using BIXOLON printers. In other words, when this mode is enabled, the printer becomes an access point(AP) requiring users to only know two pieces of information, the SoftAP’s network name (SSID) and password. The connection is then established via below steps. Turn on the BIXOLON SoftAP printerSearch the SoftAP’s network name (SSID) and enter the password using the hostThe SSID and password will then be sent to the printer through the SoftAP connection by the host device These steps are very similar to a normal AP connection procedure enabling easy setup without hesitation. The SoftAP mode is the simplest way to setup Wi-Fi with existing one-to-one network connection methods programmed for the BIXOLON printer. This SoftAP mode is available for following products: Mobile Printers: SPP-R200IIIplus, SPP-R310plus, SPP-R410, SRP-L310 and SPP-L3000 Label Printers: XT5-40 POS Printers: SRP-Q300, SRP-S300, SRP-F310II, SRP-380 and SRP-350plusIII For more information visit http://www.bixolon.com/ or alternatively speak to your local BIXOLON sales representative. When selecting the right printer for a POS application, various factors need to be considered and print resolution is a key requirement. 180dpi or 203dpi print faster and produce an identifiable image for most applications, but when it comes to printing small fonts, intricate barcodes, and graphics, higher print resolution is often required. 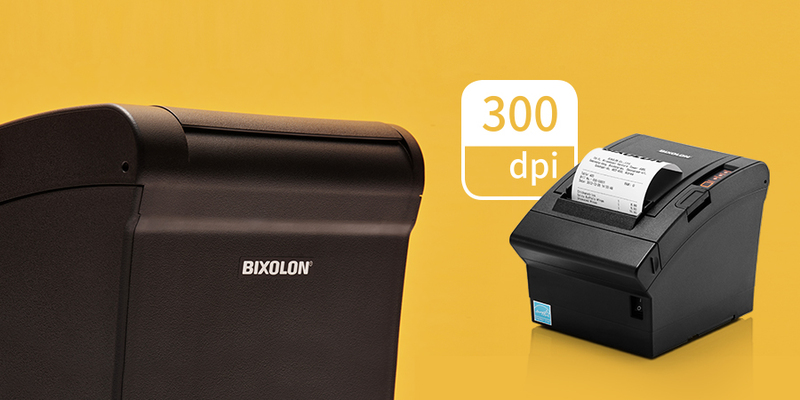 Offering 300dpi the highest resolution in the POS printer market, BIXOLON SRP-383 claims to be a top choice for those needs. Superb print qualityIt is logical that higher resolutions meet enhanced clarity, sharpness, and readability. SRP-383 ensures crisp, clear printing of 1-D and 2-D bar codes, quality texts and complex logo graphics ideal for documents such as tax refund receipts in multiple languages, invoices composed of data tables or lengthy terms and conditions. Ideal for retailers who are trying to drive sales and loyalty with coupons on receipts, print quality is the critical element in finding the right printer. If you refer to the diagram below, the images and texts at 300dpi are more recognizable and more clearly defined.Lower TCO and improved sustainability The SRP-383 prints a receipt comprised of high-density contents at 300dpi consumes 53% less paper than printing the same at 180dpi. Powered by the proprietary Auto Receipt Resize™ technology, the SRP-383 changes to print from 4-inch to 3-inch or 3-inch to 2-inch and cuts down on the use of paper by up to 52%. The technology doesn’t require users to change the original software of host devices such as driver or middleware therefore, the print quality won’t deteriorate as the sizing is reduced.These innovative paper saving solutions help improve sustainability by eliminating a significant amount of waste to landfills and CO2 emissions. Powered by TTF Font downloader™ the new utility, which easily stores True Type Fonts is already installed in the operating system of the thermal POS printer. The SRP-383 also enables IT managers to make use of a variety of receipt font styles while reducing time and cost required for developing each font. The program provides functions for downloading, editing and test printing of fonts. ​Producing perfect, scannable barcodesA 300dpi printhead allows more information to fit into smaller barcodes. The SRP-383 prints a reduced size of barcode containing a greater volume data than those printed at 180dpi or 203dpi. It’s recommended to select a printer that supports 300dpi when a relatively large amount of data needs to be stored in a barcode to avoid printing partially cut barcodes. The SRP-383 easily prints compliant, scannable barcodes onto receipt paper.For more information visit http://www.Bixolon.com, subscribe to blog.bixolon.com or alternatively speak to your local BIXOLON sales representative. In this changing technological landscape, the marketplace is growing more mobile and the demand to empower workforces with immediate Wi-Fi access for their devices is paramount to ensure seamless workflow and drive productivity for many applications such as Retail, Logistics, Manufacturing and Warehousing. However, networking a printer to a host device for wireless communication has always been a challenge. With simple and intuitive experience you would expect from configuring consumer devices, Bixolon has addressed these issues to offer a tool that can be used to easily set up a printer for a wireless network. BIXOLON’s Smart Connection™ TechnologyUsing the Easy Setup Utility app on Android™ and iOS™ devices, Bixolon printers automatically connect to the same wireless AP as the host device. Available through the Google Play™ and App Store®, the Easy Setup Utility features Smart Connection™ technology enabling BIXOLON users to experience simplified Wi-Fi set up and eliminate the process of changing network settings. The Easy Setup Utility app is compatible with the following BIXOLON mobile printer models: XT5-40, SPP-R200IIIplus, SPP-R310plus, SPP-R410, and SPP-L3000. How Does the App WorkRequiring only an SSID and Password, the host provides and encrypts this information into UDP format and sends it to the printer. The printer will then be connected to the Wi-Fi network in DHCP mode using the given SSID and Password.It’s about as simple as that: Just download the app. • Android™ APP Tutorial *Click here for iOS™ APP Tutorial For more information visit http://www.bixolon.com/, http://blog.bixolon.com/ or alternatively speak to your local BIXOLON sales representative. Since the introduction of just-in-time delivery, asset management and even internet sales, labelling has become essential in various industries such as logistics, retail and warehouse management. With many companies under pressure to improve the documentation and tracking throughout all areas of the business, many are focusing their efforts on the label design incorporating information such as 1D/2D barcodes, ID and Human readable text to collect data and reduce costs. Recognizing this need for label customization, BIXOLON has incorporated Label Artist™ Mobile, a free-of-charge label design mobile application into its menu of label printer software add-ons. Compatible with a portfolio of BIXOLON printers including SLP-TX400, SLP-TX420, SLP-DX420, SRP-E770III, SLP-DL410, SLP-TX220, SLP-DX220 desktop labelling solutions and the SPP-L3000 mobile label printer. Label ArtistTM Mobile A label design mobile application which allows users to easily edit and print labels from their chosen iOS™ or Android™ device to a BIXOLON printer using Bluetooth or Wi-Fi. USB connection is also supported for Android™ devices. Compatible with BIXOLON’s complete label printer line-up, Label Artist™ Mobile provides a range of label design functions including; - Simple label design functions including editing text, barcode, image printing - Providing various pre-designed, modifiable label formats, such as warning and event image labelling collection options. - Database utilizing Labelling (Auto count functionality) - Available through Google PlayTM and App Store® • App Tutorial Learn more about the free-of-charge PC software options Label ArtistTM II Label design software for Windows PC allows users to easily design, edit and print labels from their PC to a BIXOLON printer using USB. - Labelling program supporting editing text, barcode and image printing - Database utilizing Labelling (Auto count functionality), plus label reprint and stored editing functionality - Available through BIXOLON website Bartender UltraLite® for BIXOLON Label design software for Windows PC designed by Seagull™. This free-of-charge basic version of the software is designed for BIXOLON printer users to easily edit and print labels using USB connectivity. - Windows OS and Seagull drivers are required - Available in pre-designed, modifiable label formats - Easy to add graphics - Supporting data inputting peripherals such as scanners - Available through BIXOLON and Seagull’s website About BIXOLON BIXOLON is a leading global manufacturer of innovative, advanced printing technologies including point-of-sale receipt, label, Auto ID and mobile printers for a wide range of environments. 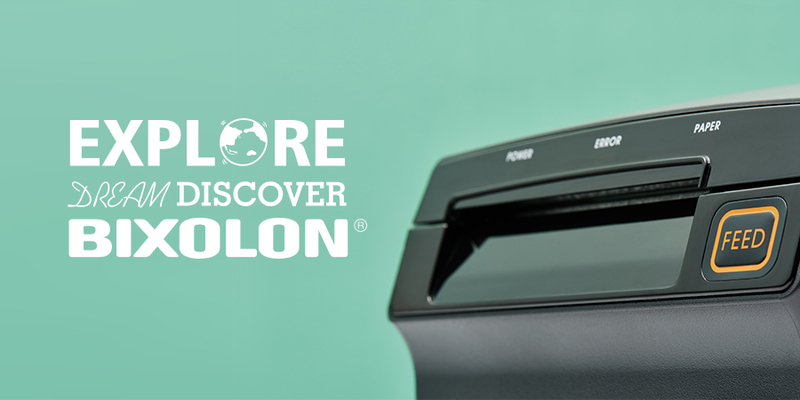 Millions of BIXOLON printers are used today in retail, hospitality, healthcare, banking, ticketing, post/parcel, warehousing and other transaction-intensive industries. In 2018, for the fifth consecutive year BIXOLON was named global mobile receipt printer market leader by Japanese research company Chunichisha. Since the introduction of multi-platform POS ecosystems, just-in-time delivery and asset management label printing technology has played a key role in the identification of products to allow easy documentation and management. In industries such as hospitality, companies come under pressure to improve data collection and reduce errors, many are quickly moving away from the traditional pen-and-paper based processes and are investing heavily in technology to increase productivity and efficiency. For example, in areas such as fast food, where its time management and order processing is imperative, staff currently struggle attaching order bills to cups, bags or wrap causing inaccurate data processing and missing orders. This issue is not just confined to hospitality. Retail distribution, logistics and warehouse businesses also have re-occurring issues trying to increase work productivity while printing. Many citing issues attaching different types of invoice labelling to their products. To resolve these issues, BIXOLON has developed a Linerless Labelling solution with B-linerless™ and Taken Sensor™ Technology. Benefits of B-linerless™ ​B-linerless™ is available in two sticky options, B-linerless™ Permanent featuring a permanent adhesive which is similar to traditional liner labels and B-linerless™ Re-stick supporting a removable and repositionable adhesive. It provides: Enhancing work productivity: Providing greater flexibility, linerless labels offer an ecological alternative to traditional label media. Allowing easy-to-use drop-in paper loading, Linerless labelling enables the possibility of providing a label of any length with the ability to still provide a clean cut without label gum build-up.Lower TCO: Removing the waste of silicon backing liner paper originally used in labelling, linerless rolls offer double the number of labels per roll, decreasing the number of roll changes. High Quality: Compatible with BIXOLON’s high-quality printers insures a long time use without jamming errors. Eco-friendly: Eliminating the waste bi-product of silicon liner backing paper, linerless labels help reduce paper waste. Why choose BIXOLON’s linerless labeling solution?Linerless paper typically has a reduced amount of adhesive spread across the media compared to traditional heavy adhesive paper which leave residue on a printer mechanisms and can cause paper jams during continuous printing. To counteract this, BIXOLON has installed Anti-Jam Technology in the SRP-S300. This technology provides special paper path design, an automatic guillotine cutting system with a revolutionary platen roller and sub roller designed with rubber material. Alongside BIXOLON’s Taken Sensor™ Technology which can calibrate this issue and make the linerless system run smoothly and effectively, by limiting linerless label printing until the current label has been removed. With these unique technologies, BIXOLON’s solution is compatible not only light adhesive linerless but also heavy adhesive linerless label printing differently from comparable solutions on the market.For more information visit http://www.bixolon.com/, http://blog.bixolon.com/ or alternatively speak to your local BIXOLON sales representative. Connecting printers to a localized Wi-Fi has always been a challenge. As technology continues to evolve, people expect to have immediate Wi-Fi access to their printers in a variety of applications such as Retail, Logistics, Transportation, Payments and Deliveries. However there are a range of issues to consider including: the IP address, security, SSID, encryption, etc when looking into device connectivity. BIXOLON’s Smart Connection™ Technology BIXOLON has addressed this issues with the Easy Setup Utility app which easily connects iOS™ mobile printers to available Wi-Fi networks. Available through the App Store®, the Easy Setup Utility features Smart Connection™ technology which enables BIXOLON users to experience Wi-Fi Infrastructure mode with simple and easy connection. The Easy Setup Utility app is compatible with the following BIXOLON mobile printer models: SPP-R200IIIplus, SPP-R310plus and SPP-R410. How does the App Work Using BIXOLON’s Smart Connection™ technology it simplifies the time-consuming process of connecting devices to Wi-Fi. Requiring only an SSID and Password, the host provides and encrypts this information into UDP format and sends it to the printer. The printer will then be connected to the Wi-Fi network in DHCP mode using the given SSID and Password. It’s about as simple as it can be: Just download the app. APP TutorialFor more information visit http://www.bixolon.com/, http://blog.bixolon.com/ or alternatively speak to your local BIXOLON sales representative. 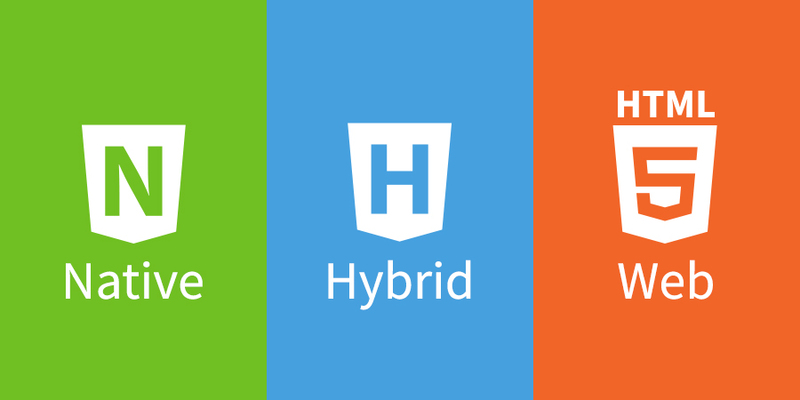 App Development Selection: Native, Web or Hybrid? Hospitality EPOS systems provide businesses with the tools to monitor and control a range of environments from restaurants and bars, to pop-up events. Choosing the right EPOS system for your hospitality business can be an overwhelming task especially if you are looking to move towards Mobile Tablet or Smart Device based software platforms due to flexibility. As technology advances, connectivity has become more crucial for successful EPOS systems. BIXOLON have put together five pointers that you may need to consider when purchasing a new Mobile EPOS (mPOS) System for your Hospitality business: Device connection – When selecting a mobile device the Hospitaliers need to decide how it is going to be connected to the host. Cabled LAN connectivity was always the norm with Wi-Fi being a trusted if not a more expensive means of achieving the same but recent advances in Bluetooth technologies have not only improved reliability but also increased the usable range. Secure login – a secure means of logging in to the system is essential to both employer and employee alike and is integral to the success of the mPOS solution as it provides the accountability that merits the system expense. Simplicity and cost have ultimately led users to rugged and durable devices such as the waterproof Dallas Reader which provides each member of staff with their own unique numerical login and if lost can be easily and quickly replaced – security is maximised as no two keys are the same. Speed of Delivery – technology can be used to speed up the order delivery process – with the right connectivity drinks orders can be sent directly to the IP rated bar thermal and food orders directly to the heat resistant dot matrix kitchen printers ensuring that the customer receives exactly what they have ordered and in a timely manner. 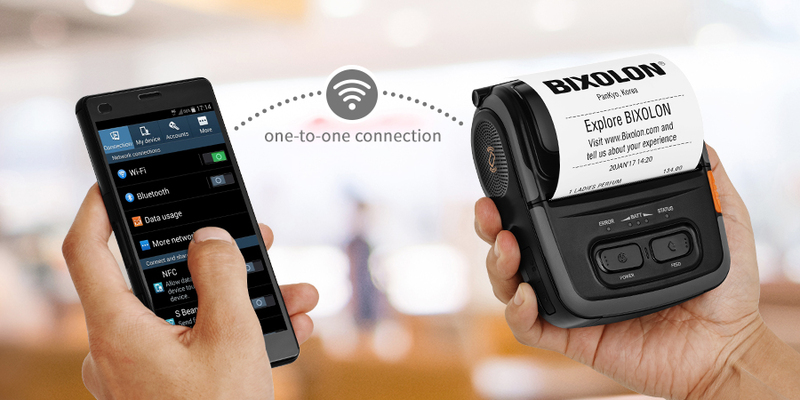 With mobile tablet based mPOS that connectivity requires devices like the Bixolon intelligent hub to provide the missing links. Greater Reach – for Alfresco dining the ability to take orders at the table can save the members of staff time by not having to return to a central point each time. 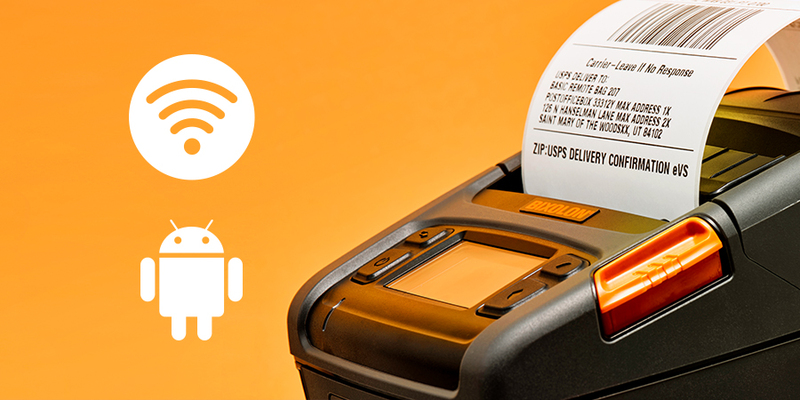 The Alfresco dining experience can be further improved by printing receipts at the table when asked – this can be achieved very simply through the use of a belt mounted printer. The latest 80mm mobile printers are small, light and rugged and print the same receipt as conventional desktop printers. Multiple device hosting – multiple device host – full hospitality process achieved by lay away split till / multiple activity requirements. The BIXOLON SRP-Q300H is the only device on the market today that can offer a solution to these five points. It provides ease of connectivity and flexibility helping to create the perfect hospitality mPOS solution. Featuring an intelligent hub (B-gate), connecting the Tablet to a host of USB peripheral devices (Dallas reader, Bar and Kitchen Printers, Customer Display, etc.) via Bluetooth whilst also providing a single charging port. Printing receipts or online orders through a native, web and cloud-based mPOS application with B-gate SDK’s (Software Development Kits). Pairing the printer with its new LCD customer Display (BCD-3000) and a robust steel tablet stand which safely secures up to a 10inch tablet using a locking mechanism to provide a complete the solution. 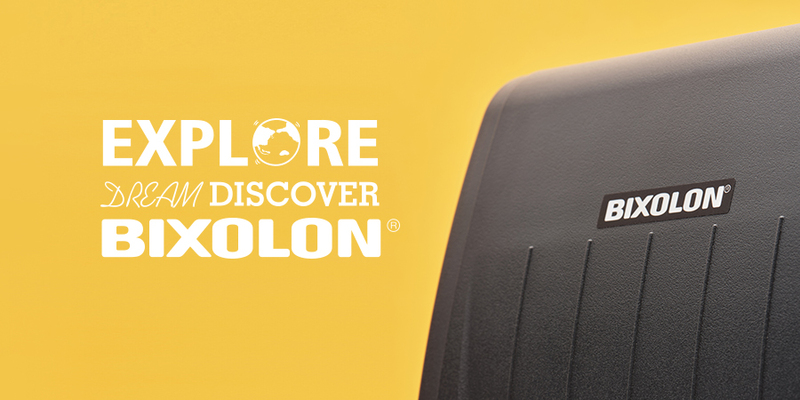 For more information visit http://www.bixolon.com or contact your local BIXOLON sales representative. We’ve all had things delivered after buying online or placing an order at the shops that had to be delivered. The deliveries are sometimes made, and a delivery note printed on the spot using a portable printer that the driver carries. 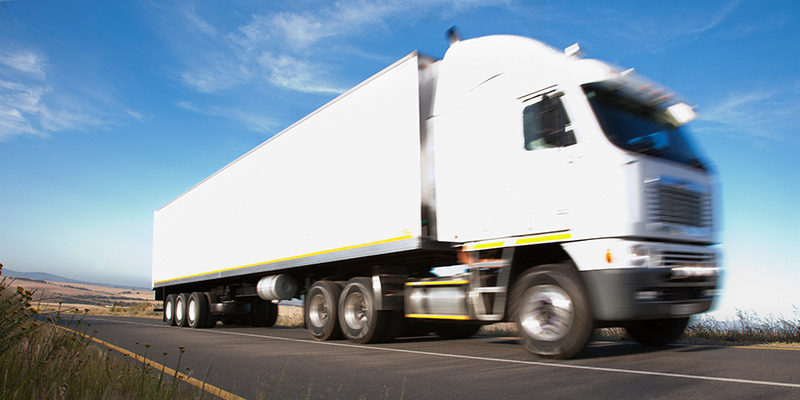 These devices are often linked via mobile telephone technology to the logistics company’s systems for tracking, stock control, and financial reporting. Behind the scenes, though, there is even more mobile printing technology in use. The products in the warehouses are often labelled to note what product it is, where it is stored, and its age. These bits of data are often placed in a barcode that can be printed from a tablet, mobile phone, or any device connected to the local WiFi network. These labels allow the individual object to be tracked throughout its progress, from manufacture to delivery. Another use the mobile printing devices have is to create labels for boxes when there are a few items being packed for shipping. The system will record all that goes into the box via scanners, and can prepare and print off a label (with or without a barcode) to inform the recipient what they’re getting, but also (with barcode) allow for tracking via the use of scanners connected to the mobile phone networks. One of the great advantages to the technology is its flexibility. There are printers that will connect to almost any device. It might be best for some of the team to use mobile phones (iOS, Android, etc. are all compatible). For presentation of information to customers, it may be more useful to connect to an iPad or other tablet. Portable printers are also available for those devices. There are also products that can be used when the actual sales are taking place on the road. For mobile retail businesses such as coffee vans, credit card payments can be taken, receipts taken, and stock noted by having the systems interconnected. All the customer sees is that he has his cup of coffee quickly and easily. But the business has streamlined so many things that the savings in running the business is significant. The main benefit to your business do come in much improved time efficiency. Rather than chasing around trying to find a package in the system, the door-to-door tracking capability allow you to quickly locate it and inform your customer. The more advanced systems even allow the customer to track their packages online. The cost savings in stock management is even more compelling. Manual inventory can be cut back to a great extent. Placing orders for restocking can be automated. Time put into these things can be saved, and time is always very valuable. 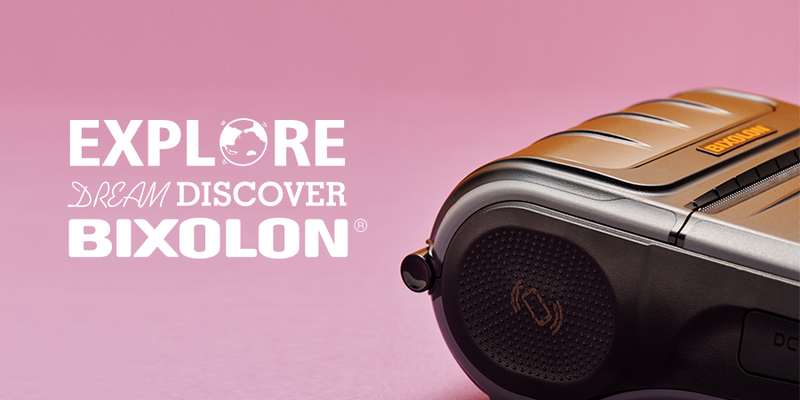 For more information visit http://www.bixolon.com or contact your local BIXOLON sales representative. Wireless printing from tablet can make the process of ordering thing, taking payment, and printing a receipt quick, easy, and very customer friendly. The first step is to connect the device to your existing network. Getting this done is sometimes challenging, but most devices have software installed to make the process reasonably painless. Just follow the instructions on the screen and have the technical details to hand in order to fill in the fields for security and connection types. Most SME’s use a local area network (LAN) that will network with the available printers and computers. A wireless network will, of course, be needed to enable printing from the tablet. The tablet will connect to the network using its setup options. 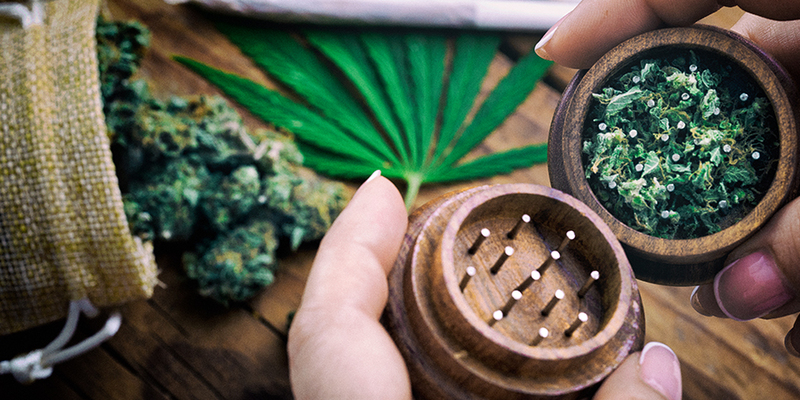 The process is somewhat different from one brand of tablet to another, but making the connection is usually straightforward. With your tablet in Wi-Fi mode the device will search for the WIFI network signal. Once the network’s signal is identified, just tap on network name on the setup page and tap in the correct login details. Once connected to the network, wireless printing can be accomplished choosing your desired printer from the available networked printers, then simply tap the print button. Adding a portable printer to the mix adds even more flexibility. Many restaurants and retail establishments are now providing their customer-facing staff with a combination of tools that allow them to process the entire transaction at the point of sale. The employees can, with a few taps on a hand-held screen, order products or simply make note of what the customer has in hand and wishes to buy. They can also take payment details and provide a receipt without leaving the point of sale. With all the devices linked into the network, the financial details, stock management information, etc., is all input in real time. The efficiencies this brings to a business are significant. In a restaurant setting, this also makes service faster. 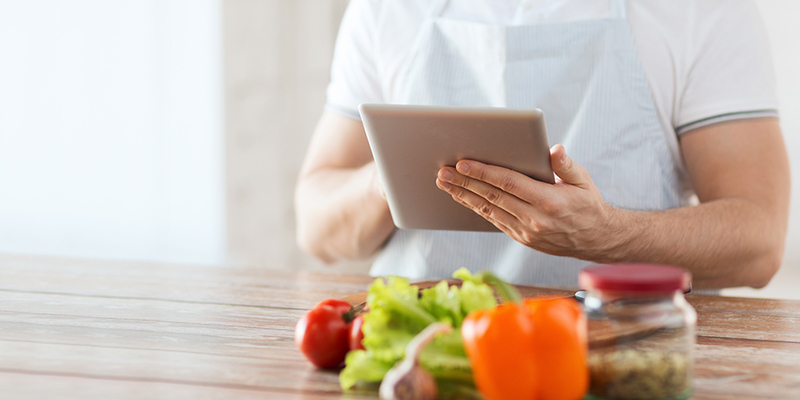 The orders can be instantly put up on a screen in the kitchen, allowing for a quicker start to the preparation process. Notification that the order is ready can also be sent to the wait-staffs tablet, hastening delivery of the food (while still hot)! When the bill is presented, payment can be taken as quickly as the customer would like, while still at their table. It all makes for a faster turnaround of tables, which is good for cashflow, but also makes for a better customer experience. Most modern tablets already have software installed that allows for printing. For some older devices, you may need to acquire software to provide a correct interface with your printer. While there may be a small cost for some of these applications, there is usually no additional ongoing cost for printing wirelessly from a tablet. The benefits to businesses that adapt to the use of tablet printers are many. The integration of the entire transactional process with the other systems (delivery, financial, inventory, etc.) brings tremendous efficiency. This allows for much faster decision making as all the data will always be up-to-date. When portable tablet printers are added to the mix, all the efficiencies just mentioned remain in effect, but the added value of better customer service and having hardcopies available is put in place. The businesses that have implemented these technologies have been extremely positive about the results. The business benefits to process improvements, and management capabilities were one aspect. The better customer service and better overall customer experience were also a strong plus. For more information visit http://www.bixolon.com or contact your local BIXOLON sales representative. Today’s methods of managing point of sale (POS) customer interactions is far different from only a few years ago. Many retail establishments have implemented hand-held devices that a customer service employee can use to check a customer out on the spot. This can be seen now in many, if not most, restaurants. Wait staff can take a customer’s credit card and take payment and provide a receipt at the table using point of sales printers. 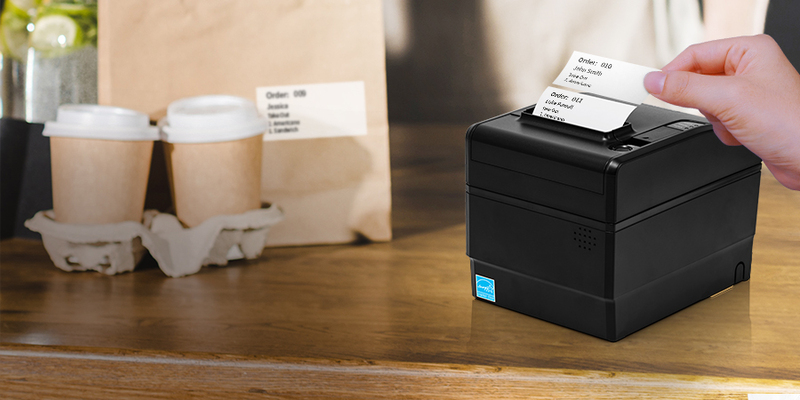 These receipt printers are lightweight and very portable. There are several types of these portable printers available, including ink jet, thermal, and dot matrix printers. Ink Jet Ink jet printers are normally used only when very high-quality printing is needed. Thius isn’t usually a requirement for receipts, but some upmarket establishments sometimes want their coloured logo or an eye-catching advertisement printed on the receipt. The ink is shot onto the paper through tiny heads, and for colour printing multiple heads are needed. The coloured inks can make replacement of the cartridges rather costly. Thermal Thermal printers work by applying a heated element to paper that is sensitive to heat. The heat darkens the paper where it makes contact. As the element moves across that paper, it can make the shape of letters, numbers and even black and white images. That said, there are newer technologies available that can produce coloured prints with thermal printers. The fact that a portable thermal printer has no need for toners or ink makes their running costs lower than for ink jet printers. Some print quality is sacrificed, though. Another drawback to the use of this technology is the life expectancy of the printed receipt. The treated paper will darken with time and can eventually make it unreadable. For most receipt, purposes, though, that slow degradation won’t matter. One thing to consider is that if these printers will spend significant time in a hot kitchen environment, the thermal paper can degrade much more quickly! Dot Matrix Dot Matrix printers are the least costly of these three options. They are hardy, and very reliable. They print by having an inked ribbon impacted by a printer head that produces dots on the paper that conform to the shapes of letters and numbers. They are capable of printing graphics, as well. Normally, these devices print in red and black, but other coloured ribbons can be found. These portable printers are generally the lowest cost, and the running costs are low, with only ribbons and normal paper to be replaced. As it is normal paper, these devices are more popular when they’ll spend time in kitchens. Connectivity When looking into what types and brands of point of sale printers you wish to use in your establishment, a consideration will be how it connects with your other systems. There are now devices that can use a phone or a tablet (both iOS and Android) to place orders. These will interface with the systems to place order with a kitchen or a stockroom, manage inventories, and compile the order documents. The same units can them process the payment and communicate with the financial management software for the business. This allows for much greater efficiencies in the day-to-day running of the business. Other Considerations The various types of printers have pluses and minuses. While dot matrix is solid, dependable, low cost initially and has low running costs, it is the slowest of the types, and is a bit noisy when printing. This can have a minor negative impact on a business’s “atmosphere”. Both Thermal and Ink Jet are faster and quieter than Dot Matrix, and have better quality pint output. They are also most costly to run. The choice come down to how high a quality output is desired, and how flexible the colour choices have to be. Lastly, the hardware and software used should be supported by the equipment supplier. Here at Bixolon we have our customer service staff on hand to handle any problems or queries, along with our online resources, and downloads areas. We are proud of our products and support our customers. See our range of Point of Sale Printers here. For more information visit http://www.bixolon.com or contact your local BIXOLON sales representative. Since the introduction just-in-time delivery, asset management and enterprise productivity label printing technology has played a key role in product identification to allow easy asset documentation and tracking. As there is increased pressure to improve the collection or data, many companies are moving away from traditional pen-and-paper processes and investing in technology to increase efficiency. While the demand continues to rise, the development for technology, particularly around areas of label printing continues to intensify. Used as one of the most basic forms of product tracking, product labelling has improved the efficiency throughout the complete supply chain. 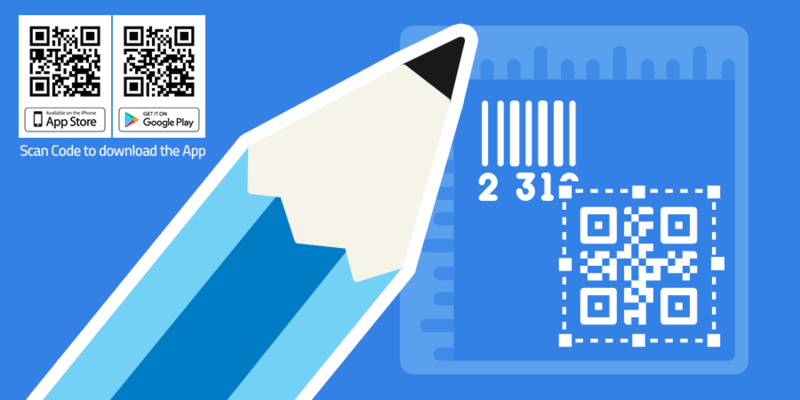 Using tracking data such as Picket Fence or Ladder barcodes to store simple numbers to innovations such as 2D or QR code labelling to hold part numbers and important product data. Standardising label printing Originally the production of labels today will come from a desktop label printer connected to a basic PC. Before use, labels will need to be designed using a dedicated label printing software. Newly designed template would be downloaded from the PC and stored on the memory of the printer. Memory size will dictate the ideal number of labels which can be stored on a printer. Customers needing to print more than one size of label will likely have to purchase multiple printers to save time and manpower continually reconfiguring the printer. Launch of mobile printing As the requirement of printing across all industries continues to advance, the arrival of new light-weight mobile printers connecting to smart devices are quickly replacing traditional desktop printers and PC set-ups. These new mobile devices are being developed to provide scan to print solutions, removing the need for pre-stored data and additional hardware. Providing flexibility and increased productivity, mobile printers can reduce printing costs across all market sectors. 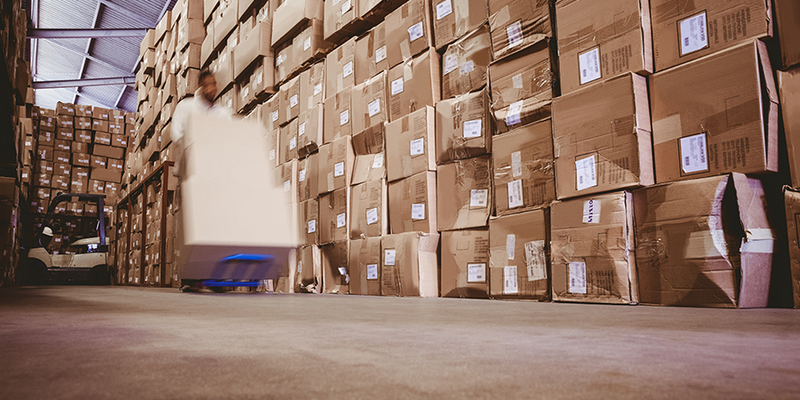 With Bluetooth and Wi-Fi connectivity innovation at their core, handheld devices such as PDAs can easily be linked directly to a supply chain network. Communication between the network server and handheld device enables easy information download and storage, enabling easy warehouse product picking or logistics delivery. Progression in printing technology has paved the way for new technologies such as of Near Field Communication (NFC), making it even simpler to pair handheld devices with accompanying printing technology. But what about the media? As the use of labelling continues to diversify, there has been major leaps in the development of label media. While printers are becoming more adaptable, the requirement for dynamic print media for the changes in environment, usage and technology continues to grow. Resulting in a necessity for technology such as specialised linerless label printing. Delivering increased flexibility and an ecological alternative to traditional label media by eliminating the waste bi-product of silicon backing paper originally used in labelling. Linerless label rolls offer double the number of labels per roll. Linerless labelling also aids the possibility of providing clean cut variable label length. As the role of labelling continues to evolve and the importance of Auto-ID continues to rise in improving data entry, tracking and more. The requirement for accurate label referencing is becoming increasingly important across all industries. For more information visit http://www.bixolon.com or contact your local BIXOLON sales representative. Whether working at a distribution facility, on a factory floor or in an office; you’ve likely used or required a label printer at some point. Not only are they incredible useful in labelling and managing stock, but can play as important a role in managing internal documents and files to ensure none go astray. In a follow-up to our guides on mobile and thermal printers, we’ll be delving into the technicalities of label printing. What’s more, we’ll be exploring what use cases a label printer has and what you need to consider when purchasing one for your organisation. What is a Label Printer and How Do They Work? Unlike usual household printers, however, label printers must be capable of printing on a variety of materials. These materials will often include plastic or thermosensitive paper. This is as these materials provide greater longevity and can handle the challenges that come with long-term storage and extensive travel. In some circumstances, such as when printing an RFID tag, the label printer will require more extensive technological capabilities. This could, for example, include the ability to code the radio-frequency identification number whilst inputting it into a database. Which Label Printer is Right for You? With a huge variety of label printers available online, understanding which meets the demands of your organisation can be a challenge. The first step, therefore, is determining whether you will need a label printer of a personal, commercial or industrial standard. You may also require advanced options with support for RFID coding and printing. If you require a personal label printer which simply requires you to input a barcode or text manually, then those available in some stationary stores will suffice. If you require one of a commercial or industrial standard, however, there are a plethora of other questions which must be answered. Firstly, do you prefer thermal transfer or direct thermal printing? Whilst the details of these are outlined in our guide to thermal printers, it is widely considered that direct thermal printing is a costlier affair with the print head having to be changed more frequently. Direct thermal printing, however, can provide a more consistent and clear print quality.Another consideration that must be made is the connectivity offered by the printer. For example, does it support Ethernet and USB connectivity? You should also dedicate a healthy amount of time into understanding the programming languages supported by the printer and the level of technical support that you will receive moving forward. Found the Label Printer for You? Having considered the standard of printer you require, printing technology that’s necessary and additional connectivity you will require, you are now able to make an educated choice as to which label printer is right for you. For more information visit http://www.bixolon.com or contact your local BIXOLON sales representative. As consumers demands shift, so too does the technology that businesses use to service them. Whether it be using large computers to take orders in fast food restaurants or handheld devices to take drink orders in a busy cinema, the technology that businesses used five years ago simply doesn’t work in today’s fast moving and customer centric world. Mobile printers are beginning to play an increasingly important part in many businesses. Restaurants use them to provide credit card receipts, pawn shops use them to provide handling of goods receipts and many other businesses rely on them for an array of businesses. For those starting a new business or adopting this technology, understanding what to look for in a mobile printing device is important. With their premium price tags and important role, overlooking even the simplest of specifications could have a significant commercial impact. In this article, we’re following on from our previous guide to thermal printers and will be sharing our insights on choosing the perfect mobile printer for you. We’ll delve into the technicalities of our own devices and explore the benefits of mobile printers when compared to alternatives. What is a Mobile Printer and Why Use Them? Whether working in retail, hospitality, transport or logistics; you will have undoubtedly encountered a mobile printer at some point. They are often found partnered with either a tablet or card reader. Mobile printers do, in most circumstances, utilise ink-based printing. Thermal printing, which is covered further in our previous article, is more common on large label printers. Unlike thermal printing, ink-based printing can achieve a print speed of up to 80mm per second. Furthermore, it can provide a greater variety of colours and high 203dpi print quality in some circumstances. Mobile printers also work perfectly with tablets and smartphones. Our SPP-R400, for example, is compatible with the Apple iOS, Android, Symbian and Windows operating systems. When this compatibility is partnered with its USB, Bluetooth and WiFi support, the possible uses are truly endless. Which Mobile Printer is Right for You? When shopping for a mobile printer, you will be left shocked by the vast variety on offer from a varying selection of manufacturers. Whilst many of these will provide a decent print quality and support USB connectivity, there are of course many other things you should take into consideration. Firstly, and as mentioned above, understanding what level of operating system compatibility and connectivity is available is essential. Should you be looking to utilise a tablet or smartphone to offer tableside payment, for example, ensuring that your mobile printing device supports both the iOS and Android operation systems is pivotal. Without such support, connecting your mobile printer to an iPad or Android smartphone could prove challenging. An additional consideration that should be made when purchasing a mobile printer is the drop testing it has been put through. Our SPP-R310, for example, has a drop test certification of 1.8 metres. It is also IP54 dust proof and water resistant. Assuming compatibility, connectivity and adequate drop testing having been performed, you will likely have found the ideal mobile printer. The final consideration, however, is what level of support the manufacturer provides in the future. Whether it be through easily available technical documents or telephone support, ensuring that both hardware and software support is provided is vital. For more information visit http://www.bixolon.com or contact your local BIXOLON sales representative. Thermal printing may seem a thing of the past for many who have become accustomed with laser and inkjet printers in recent years. Thermal printers do, however, continue to be used by many sizeable operations within both the manufacturing and logistics sector. This is partly due to the low initial investment and little ongoing maintenance they require. As a leading manufacturer of both thermal transfer and direct thermal printers, BIXOLON works with organisations around the globe to find the perfect solution for them, whether it be for simple barcoding, compliance labelling or small parts tracking. However, many organisations still turn to expensive and high maintenance printing solutions due to them knowing little about thermal alternatives and the benefits they can offer. In this article, we’ll delve into the technicalities of thermal printing and what separates it from alternative solutions. We’ll also explore what you should look for when shopping for a printer, whatever your budget and requirements. What is Thermal Printing and How Does It Work? 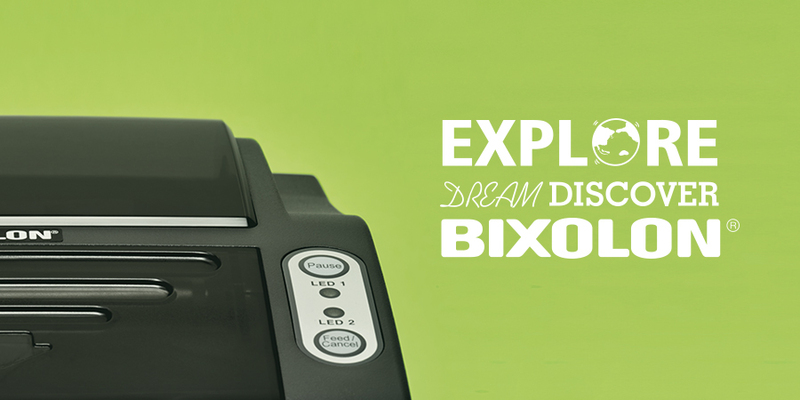 BIXOLON SRP-330II Thermal Printer The first of these components in a thermal head, which is the primary component for generating heat and produces the image on the thermal paper as it passes over. The thermal head selectively heats areas of the paper, dependent upon what has been inputted into the printer, and turns the special coating located on the thermal paper black. When a printer supports additional colours, such as red, the thermal head will produce two different temperatures to determine which areas of the image are black and which are coloured. For the thermal head to make contact with the thermal paper, a spring is required. This component is simple in nature and ensures that the thermal head sits appropriately on the paper to create a clear image without any severe damage being caused to the paper. Another important component within any thermal printer is the platen, a rubber roller that feeds paper into the device itself. This platen is like that found on most laser printers and ensures that the paper is feed into the printer straight and therefore produces a high-quality and straight print. Finally, for each of the previously listed components to work in synergy a controller board is necessary. It is this board, which works similarly to a computers mother board, that provides the user interface displayed on the printers’ screen, manoeuvres the various components and warns of any issues. Which Thermal Printing Solution is Right for You? The thermal printing market is one of huge variety. In fact, BIXOLON alone manufacture and sell a wide collection of thermal transfer and direct thermal printers. Each of these printers are designed for different uses and offer varied levels of technical capabilities. BIXOLON SLP-T400 Thermal Printer The BIXOLON DLP-T400 printer, for example, is ideal for those in search of a simple yet reliable desktop printer for barcode, QR and labelling requirements. 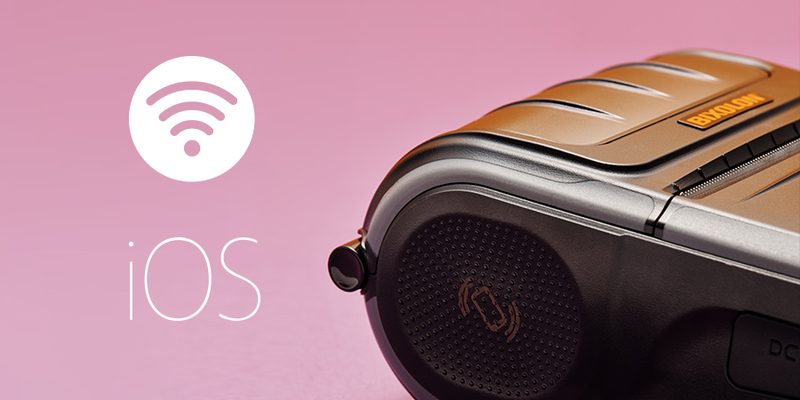 Our SLP-TX400, on the other hand, features our Smart Media Detection technology. This helps detect the media being used and alter the printing accordingly. For most organisations the most important consideration is the compatibility a chosen printer provides and the wired connections it offers. This is as a lack of WLAN connectivity could be the difference between your printer working with your existing system or not. Finally, selecting a thermal printer ensuring that it works with the various programming languages, including SLCS, is wise. For more information visit http://www.bixolon.com or contact your local BIXOLON sales representative. You can see our entire range of thermal printers here.